MSI announced a new range of All-in-One computers that use LED-backlit screens. MSI, the global leading brand in All-in-One PC, will be showcasing its new range of All-in-One PCs – which feature vivid color and emphasize environmentally-friendly "green" business capabilities and "smart" digital lifestyle enhancement – at the Computex Taipei 2011 exhibition. Impressed by the energy-saving, lightweight, environmentally-friendly potential of LED panel, MSI is leading the way by incorporating LED-backlit LCD display technology into its All-in-One PCs, together with multi-touch touch-screen function and full-HD resolution, marking the beginning of a new era in PC visual performance and ease of use. MSI's new LED All-in-One PCs – the Wind Top AE2211G, AE2211 and AP2011 – feature enhanced energy-saving characteristics, rich colors and impressive brightness that are sure to make them a major focus of attention at this year's Computex show. As part of its efforts to facilitate easy synchronization for today's digital lifestyles, MSI is now incorporating personal cloud concept applications - Smart Media Link and Smart Sync - into its products. 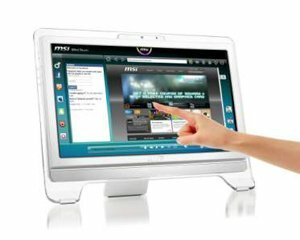 The cloud computing enabled All-in-One PCs that MSI will be showcasing at Computex 2011 make it possible for consumers to share audiovisual entertainment content conveniently over the Internet using touch-screen control. MSI's Wind Top AE2410 and AE2070 All-in-One PCs (which are equipped with the ultra-powerful second-generation Intel CoreTM i3/i5 processor), as well as the AE2230, which employs AMD's latest Sabine platform, all use MSI's unique Wind Touch 4 touch-screen user interface software, which will also be a big draw at this year's Computex. MSI is setting a new market trend by incorporating LED backlight technology into its Wind Top AE2211G, AE2211 and Wind Top AE2230 home user entertainment All-in-One PCs. The combination of an ultra-lightweight LED display and 1920 × 1080 pixel Full HD resolution provides brighter, more detailed images; reds are more vivid, yellows are more striking, blues are more translucent. The use of LED-backlit panel gives MSI's LED All-in-One PCs superior contrast and rich colors; the effect is closer to that of viewing under natural light conditions, which makes for a significant enhancement of image quality, giving users an unprecedentedly rich viewing experience when watching video content or looking at photos. The 22-inch display features HDMI input/output, making it easy and convenient to project video content, or convert for a separate display. MSI's AE2211G, AE2211 home entertainment All-in-One PC is equipped with Intel's second-generation Core i3/i5 processor, while the AE2230 runs AMD's new Sabine processor. Both of these processors embody the latest technology and provide outstanding performance. MSI also includes ArtRage 3 digital painting software as standard in its new All-in-One PCs. When combined with the PCs' highly sensitive multi-touch control interface, this software allows users to create watercolor or oil painting style images directly on the screen using ordinary watercolor brush techniques; with this software, anyone can enjoy the experience of creating their own art. Eco Professioanl AIO, Eye-Friendly DesignRecognizing that people today are spending more and more time using their PCs, when designing its Wind Top AP2011 All-in-One PC for business users, MSI adopted a 20-inch anti-glare LED-backlit display design. Besides enhancing the clarity of the screen image, this design also reduces the strain on the eyes caused by reflections from the screen, thereby helping to prevent the eyesight impairment that can result from extended periods of computer use. Besides this health benefit, LED-backlit panel provides energy saving of over 30% compared to conventional CCFL panel. In addition to its energy-saving characteristics, the use of LED-backlit panel also helps to increase panel lifespan. This new All-in-One PC therefore provides both energy conservation and environmental protection benefits; MSI is working with you to help protect the planet! The Wind Top AP2011 has been designed with an adjustable stand to meet the needs of different business usage scenarios. It pivots freely, can be swiveled left or right, and the height and display angle can be adjusted easily; it can also be stood up perpendicularly on the desktop. The adjustable display makes the PC easy to use while providing maximum viewing flexibility; it also dramatically reduces the amount of space needed to use the PC, which is a boon for business users. MSI has also equipped the Wind Top AP2011 with a pair of COM ports so that business enterprises such as restaurants, hotels, convenience stores, filling stations etc. can link the PC up to a barcode scanner or credit card terminal when necessary. MSI's All-in-One PCs for business users, including the Wind Top AP2011 and Wind Top AP2000, really are the ideal choice for enterprise use! MSI's All-in-One PCs embody ongoing technological innovation, and are setting new trends in the field of digital lifestyle technology. These PCs are the first products of their kind to be integrated with personal cloud computing through the adoption of MSI's Smart Media Link and Smart Sync technology. With this technology, users no longer need to rely on pen drives to share content between devices; just touch the screen, and you can use LAN, Wi-Fi or streaming to share photos, music, films etc. stored on a wide range of computer or video playing platforms. In addition, Smart Sync facilitates synchronizing of your Microsoft Outlook calendar and contacts, ideal for business people who need to synchronize their mobile computing device with their home PC. In addition, the smart technology used in MSI's All-in-One PCs means that these PCs can be linked with other digital audiovisual player devices in the home to serve as an audiovisual controller; the All-in-One PC can be employed to control the displaying of photos and video content and the playing of music on the TV, wireless-equipped speakers, game consoles (such as the Xbox or PS3), or a desktop or notebook PC in another room. By combining networking technology and the use of the All-in-One PC as a controller, it is possible for every member of the household to share audiovisual content in their bedroom, living room or study. MSI allows you to leverage the power of "personal cloud computing" to create a genuine "smart digital lifestyle." MSI's Unique, Intuitive Touch-screen Interface Facilitates Smooth, Continuous Social Networking MSI has introduced the fourth generation of its highly-praised Wind Touch touch-screen interface software, which features improved social networking functionality and touch-screen calendar management. While they are online, Wind Touch users can simultaneously use the same interface to check messages on social networking sites; with this software, you can update your profile and keep up with what your friends are doing all the time. The touch-screen calendar management function is ideal for the elderly, children and other people who find using a keyboard difficult; you can use the touch-screen display to leave messages, make a note of friends' birthdays, or create a list of "things to do." Large icons make it easy for users to check the time, access the weather report, view photos, or listen to the music, just by pressing the screen. Besides the new Wind Touch 4, the MSI All-in-One PC range also features a wide range of personal creativity and education software, as well as software designed to meet the needs of senior citizens. The easy-to-use interface and multi-touch display make MSI All-in-One PCs highly intuitive, and ideal for users of all ages.